Dallas seemed to discover mezcal in 2017. Bottles of the agave-based liquor appeared on back bars across the city, along with flights and tastings and educational spiels. Peter Novotny and Dan Murry, the guys behind cocktail den Armoury D.E., embraced the trend last year and opened Ruins. 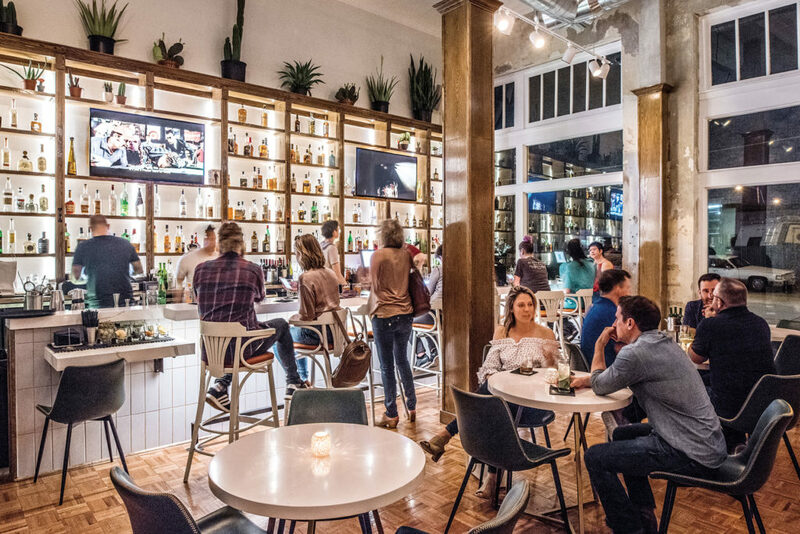 The bar is in the old Luscher’s Red Hots space in Deep Ellum and offers 110 mezcals, 75 tequilas, and more than 75 rums. 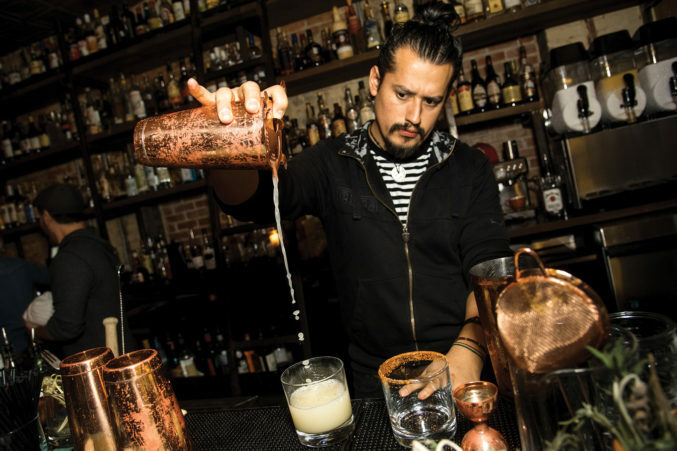 Their focus is agave- and cane-based spirits, and while they execute their cocktails with precision (many come garnished with fresh flowers—frilly! ), this spot is relaxed and unpretentious. 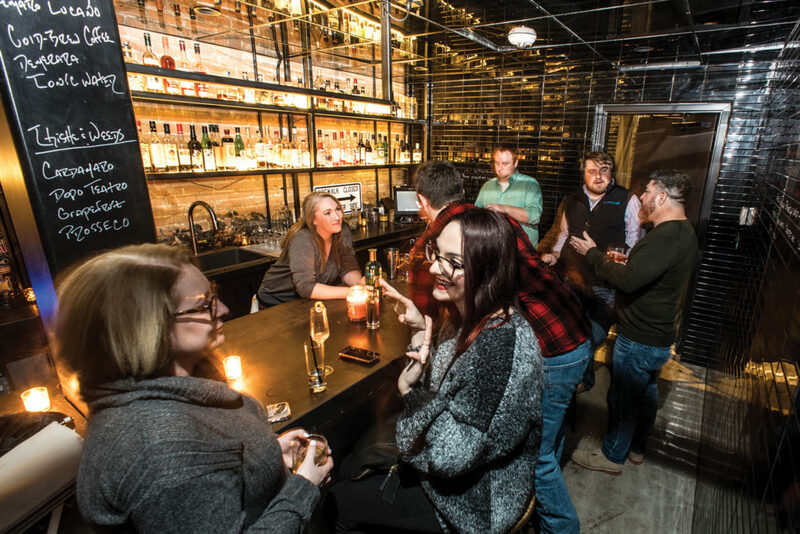 Aesthetically, it’s what you’d expect from the neighborhood: exposed-brick walls, a sprawling industrial-looking bar with metal stools, a patio with a mural. But you’ll also find flickering prayer candles and Mexican folk art. Oh, and there’s a stage in back, next to a second bar, which features live music and DJs. After the bartender has done his work, see if you’re inspired to try the chapulines. For you norteños, that means grasshoppers. This place self-identifies as a restaurant. We disagree. 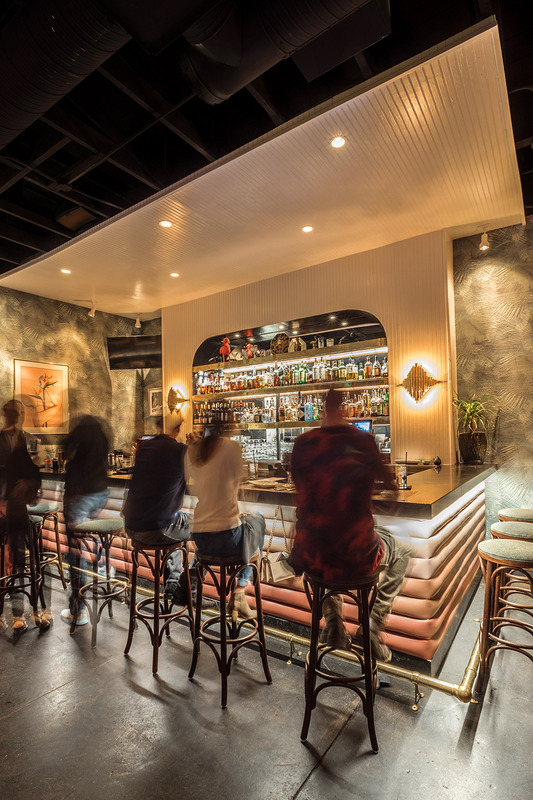 Sure, there’s a menu offering Pan-Asian bites, and, sure, you can soak up that tequila-heavy Alice Mule with some braised brisket steamed buns if that’s what your innards desire. But the real appeal of this Old East Dallas hang is its loungy vibe and lively cocktails. Take the tropical glamour of 1950s Miami and combine it with a shadowy midcentury watering hole in Manhattan. Pipe in an ’80s-centric playlist. Invite some guys in blazers and some gals in sequined dresses to hang—and, while you’re at it, a few not-so-glitzy neighborhood regulars. There, that’s Alice. It might sound weird, but it works. The intimate space, formerly Joyce & Gigi’s, is festooned with vintage photographs, floral wallpaper, plush emerald green bench seating, marble tables, and a disco ball. The cocktail list is limited, but we suggest the lychee martini made with Ketel One, lychee, lime, and grapefruit. That, or a glass of wine. Weekends here are animated with help from a DJ. Don’t just drink at bars. Eat, too. You can find basically anything in a Dallas bar—that means cheese fries, yes, but also pho and octopus and bison chili. This is the best bar food in Dallas. Harlowe MXM, the 18,000-square-foot cocktail-centric restaurant on the corner of Main and Malcolm X, is a beast. Next to Harlowe MXM, you will find its smaller, less-beastly cocktail bar, Trick Pony. And, if it’s a Friday or Saturday night past 8 pm, in the rear of Trick Pony, behind a mirrored door, you’ll discover Pony Tail. This is the tiniest matryoshka doll of the bunch. The 200-square-foot place fits just six people. It is dark and moody, with a back-lit bar and twinkling candles. They specialize in amari here. The bitter Italian liqueurs, traditionally post-meal digestifs, employ a range of base components but are predominantly barrel-aged and infused with herbs, flowers, spices, and roots. 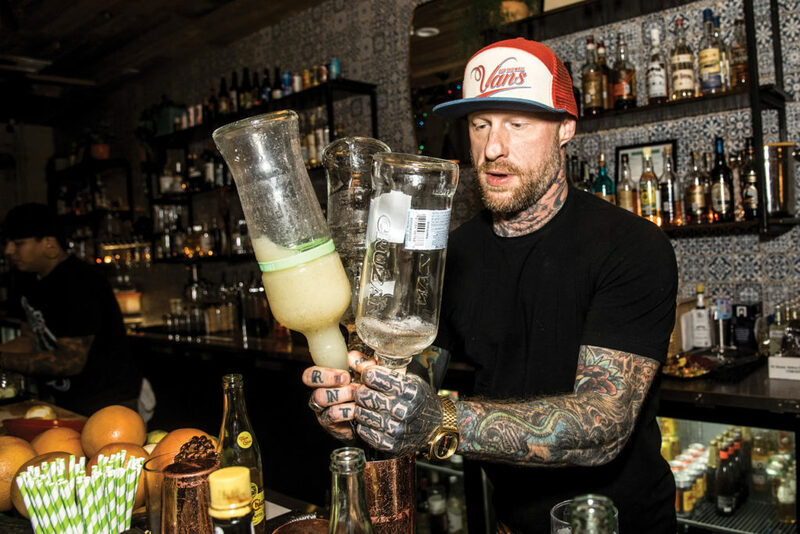 Bar manager Ricky Cleva prides himself on offering one of the largest Italian bitters selection in the city, with nearly 80, and his team is eager to share their knowledge with the curious. Order a tasting and let them teach you. Not into learning? (We’re judging you a little.) Order an amaro-centric cocktail instead. Pony Tail is the perfect space to slide into after chowing down on a 44 Farms beef short rib next door. That is, if you can get in. The main reason to visit Waterproof is the view. 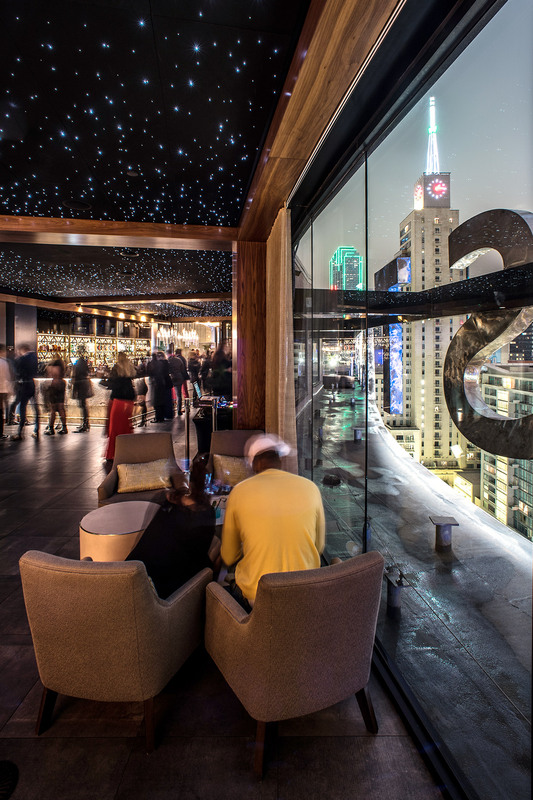 The stylish patio and lounge, located on the 19th floor of the recently remodeled Statler Hotel, provides guests with a panoramic perch of downtown Dallas and the surrounding areas. It’s stunning, especially at night. During the day, throughout warmer months, DJs spin electronic dance music while guests splash around in the rooftop pool. The spot draws a youngish crowd looking to party. Cocktails here are ambitious but can be inconsistent. Stick to beer, wine, and Champagne if you’re looking to snag a buzz. Those who’d like to make an entire day of it can order bottle service, receive a poolside pedicure, or get a massage in one of the water-facing cabanas. There are dives and dens, saloons and sports bars, hotel bars and just bar bars on this list of 30 iconic establishments. Some could only exist here. Some seem like they always have. We will just say this: Dallas couldn’t exist without them. Or it shouldn’t. Deep Ellum Hostel owners Collin Ballard and Kent Roth spent a lot of time in Spain, which is where they found the inspiration for Izkina, the hostel’s bar. The building on Elm Street was once an auto repair shop, but you wouldn’t guess it. Plush teal benches line an exposed-brick wall, bunches of herbs and bowls filled with pudgy citrus span a white marble-esque bar, palms dip over leather Chesterfield sofas, and a red snapper carcass hangs from the ceiling in the semi-open kitchen. The food here is good. Executive chef Joel Orsini plates a variety of tapas, including pickled tomato tarts, rice-stuffed squid, and Spanish tinned fish. Cocktails include Spanish classics like Kalimotxo (red wine and cola) and Rebujito (sherry and lemon soda). The bar also offers two sangrias and 10 renditions of a gin and tonic. Don’t feel the need to stick to the menu, though. The bartenders like to play. Tell them your favorite fruit, zodiac sign, and the name of your middle school crush, and see what they come up with. This cozy 1,000-square-foot space isn’t far from the main Bishop Arts District. It draws a relaxed, local crowd, and though it be but little, it makes a fierce impression. From clusters of eclectic paintings on its exposed-brick walls to the tattooed bartenders who are just the right level of aloof to the immensely Instagrammable cocktails—no doubt about it, Tiny Victories is cool. But it’s not so cool that it can’t be comfy. It just might be the sweet spot where “neighborhood watering hole” and “cocktail lounge” come together into one nice little package. The music is good, the crowd is chill, and the bartenders do as well with faithful renditions of classic cocktails like the Old Fashioned as they do with snazzy drinks like the pretty Bidi Bidi Bom Bom (tequila, mint, hibiscus agave, and lime). There’s a small patio outside for when the weather’s tolerable, and there’s often something fun going on (trivia, bingo, movie nights). If you make it in early enough, you might even find some happy hour deals. In the 1920s, Tyler Station was the site of a wax paper company. 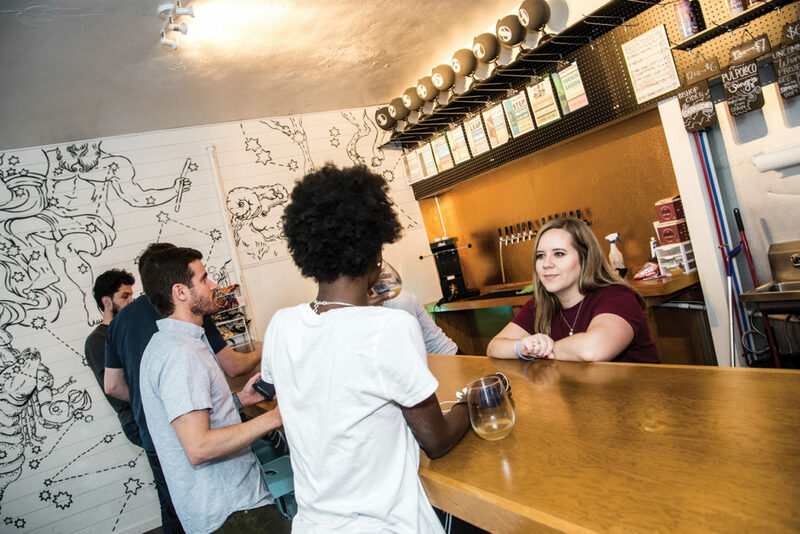 Now it’s a creative enclave comprised of small businesses that work together to grow. 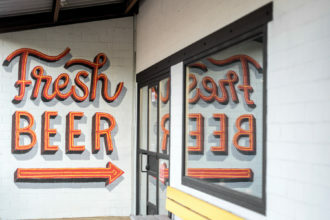 Joining the roundup of artists, designers, and florists is recent newcomer Oak Cliff Brewing Company, Oak Cliff’s second craft brewery since Small opened in 2014. 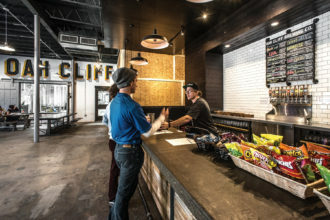 The taproom space is cinder block-chic, with a sparse, industrial bar area and picnic tables set up across a sprawling floor. There’s a foosball table by a window, through which you can watch the train coming and going from the adjacent DART station. If you ask nicely, one of the bartenders might give you a quick tour of the brewing equipment in the back area. OCBC serves a rotating selection of brews, but the Oak Cliff IPA, Farmhouse, Black Lager, and Export Lager form the base of the brewery. Founder Joel Denton calls them the “core four.” Fortunately, the taproom provides the option of a four-beer flight, an easy way to find out which one you like best. The problem is, you’ll probably like them all. A fringe of tiki grass hangs over the bar. Island-flavored tchotchkes, like mermaid figureheads and ukuleles and an old life preserver, adorn the walls. 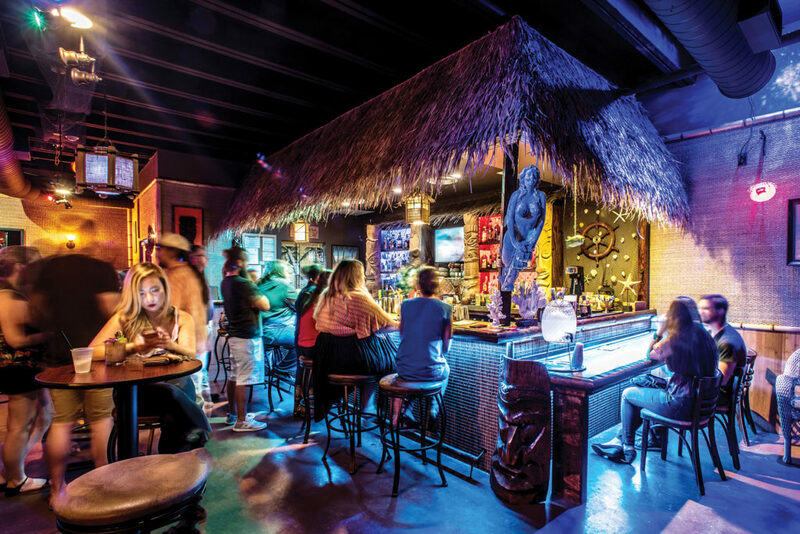 Surf rock plays overhead, and the bartenders (and some of the regulars) are decked out in their aloha-shirt finest. But the festive Polynesian-inspired ambience isn’t what makes 4 Kahunas the real tiki deal—it’s the drinks. The menu created by Brad Bowden features more than 30 island-inspired libations made with fresh fruit, house-made syrups, and a variety of delicious alcoholic combinations. For purist tikiphiles, try Trader Vic’s original Mai Tai 1944, the Kahuna Painkiller, or the Navy Grog. If you’re looking for something original, check out the Yellow Rose, made with Texas whiskey, or the Brain Child, a fruit, rum, liqueur, and Rockstar combo. If you’re overwhelmed by the selection, the bartenders are more than happy to help. And it’s such a laid-back space that you’ll be comfortable hanging out for as long as it takes to discover the drink of your dreams. The bartender at Mama Tried poured a shot of Jameson with one hand and two shots of Tullamore Dew with the other. He cracked open a beer, then leveled his gaze on us. 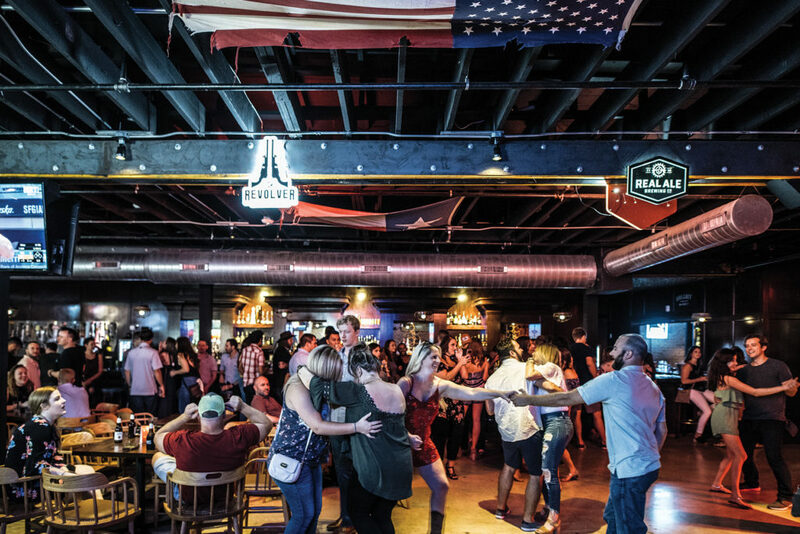 We’d just walked into the Deep Ellum honky-tonk, and people in plaid, denim, and cowboy hats congregated near the bar, all sipping whiskey or beer. A woman in jean shorts shot pool nearby. Onstage, an enthusiastic KJ in a black hat tried to coax drinkers into singing. We meandered to the outdoor patio, where we took turns posing for photos in the old rocking chairs. Then we went inside and posted up near a wall covered in photos of country music singers. The KJ persuaded a couple of inebriated women to join him for a karaoke rendition of Garth Brooks’ “Friends in Low Places.” The ladies began calling to their friends, and before long there was a choir of nine women, two of whom wore Dak Prescott jerseys. “I’ve got friends,” the KJ sang, “at Mama Tried.” I might have rolled my eyes at that pandering revision, but by then the whole bar was singing along. Matt and Molly Reynolds, the husband-and-wife team behind this Medical District brewery and taproom, are obsessed with hops. One of their most popular brews is Cerberus, named after the three-headed dog in Greek mythology who guards the gates of the underworld. The murky double IPA is a collaboration between Oak Cliff Brewing and Turning Point Beer in Bedford. It’s triple dry-hopped with Idaho 7 and Vic Secret and has a 0 IBU, meaning no additional hops are added during the boiling process. This is getting nerdy. Let’s slow down. What this means: this beer uses plenty of hops but without the bitter flavor associated with “hoppy beers.” Cool, right? The bright, white taproom is spacious, with constellations painted across the walls. Oh, and there’s a cheeky pink neon sign near the bathrooms that advises beer sippers to “Follow the Call of the Disco Ball,” whatever that means. Celestial has been open for only a few months, but it already draws a steady stream of neighborhood regulars. Weekly events keep it lively, with yoga every other Saturday, trivia on Thursdays, and bring-your-own vinyl on Sundays.